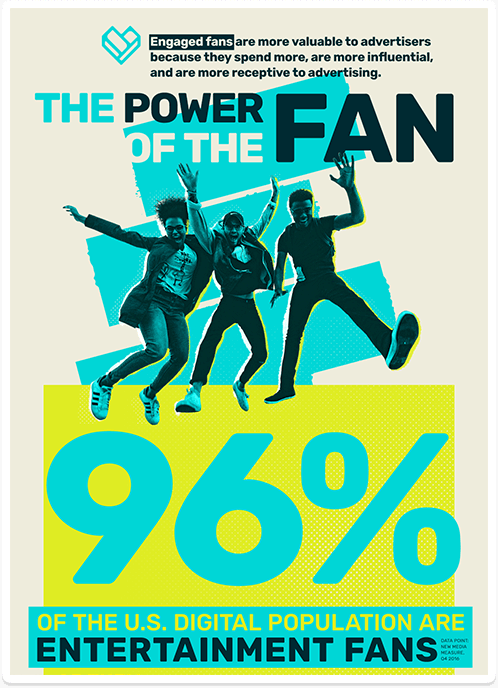 The Power of the Fan is a groundbreaking project from FANDOM and comScore. It profiles the U.S. entertainment fan landscape in a way that no other research has attempted. We looked at comScore’s census network that measures over 1.8 trillion global interactions each month and sampled the content consumption habits of over 250,000 fans. We then analyzed those habits across nearly 400 categories of content and combined that data with a survey of over 5,000 fans in the U.S. The survey profiled the attitudes and behaviors associated with more than 15,000 unique movie, TV show, and video game experiences. Fueled by this mountain of data, The Power of the Fan reveals the most valuable audiences for advertisers to harness the passion of pop culture fans on FANDOM and across the web.